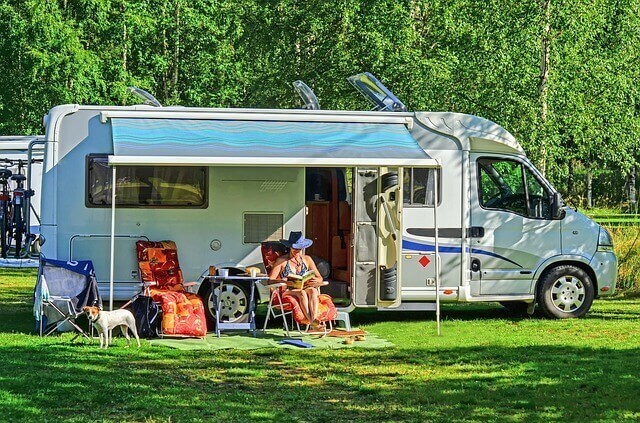 If you’re planning a family time with your family in nature in your RV, you definitely need an inverter to power up your necessary devices and appliances. There are so many inverters in the market, you can easily choose any from them. But if you choose an inverter randomly, you can’t expect that will be able to provide you the support you need for your adventure time. So you to know what an RV inverter is and the types of the inverter and definitely the features that will help you to choose you the best one. In this buying guide, you’ll find all these informations along with 10 best inverters that are well known nowadays. For a reasonable price, an RV inverter can’t be better than this model of AIMS inverter. It is compatible with over 7 types of batteries. With a proper charge controller, it can be mounted to a solar panel as well. There are fewer possibilities of experiencing damage due to extremely high or low voltage. Because the remote panel that comes with this inverter shows necessary info along with the facilities of controlling the inverter itself. To get to most of its advantage of the auto-gen feature, you have to plug it to a specific type of generator. So, when the power is at the bottom, it turns on the generator and chargers on its own. It's okay if you don’t want to invest in a generator right away. The inverter is a life saver with or without a generator in times of emergencies. It goes to hibernation mode when the power is low to save the minimum power you need to seek help in convenient ways. This unit one of the most popular and widely used inverters out there. You don’t need to worry about the warranty or customer service. Its longevity does not need those services. Compatible to 7 types of batteries. 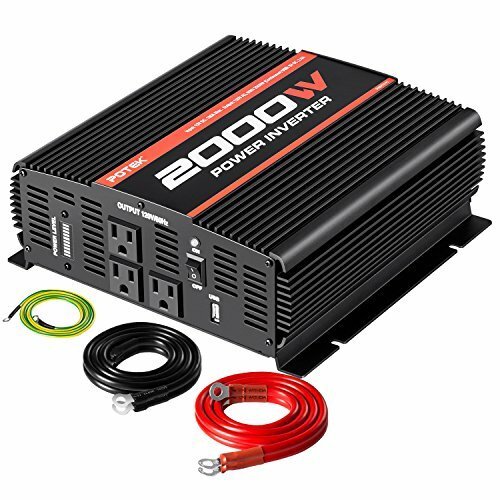 In our list of best RV inverters, Go Power inverter of GP-SW3000-12 model is the most expensive one. Once you get the inverter and meet its customer service, you will also agree that the price is totally worth it. For any kind of inconvenience, the manufacturer usually replaces the total unit without any additional cost. 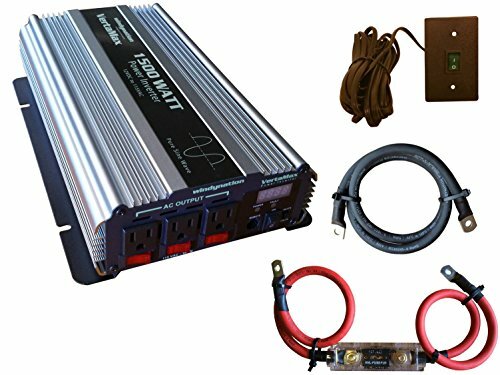 However, as for the performance, its 3000-watt continuous power is enough to run most of the belongings people usually have in their RV. it is lightweight, hence the inverter is also suitable for small boats, camping, and many more endless possibilities. This unit has 2 GFCI outlets whereas another model of similar capacity has only one GFCI outlet. This inverter is basically a sleek box. There is no way to monitor its frequency or voltage. I recommend purchasing a remote power meter to monitor its performance. The inverter is protected by overload protection, high and low voltage protection. The power quality and consistency are satisfactory. To meet the basic needs of an off-grid power option during emergencies, we don’t need fancy high capacity inverters. In those situations, a low capacity inverter is easier to use and more convenient to charge with just a 12v DC battery. Ampeak inverter has only 2000 watt continuous capacity and can take up to 4000 watts. But it merely resists 3000 watts without notifying overload alarm. However, that capacity should suffice for a small refrigerator, blender, vacuum and other machines. Don’t use it to charge your phone unless you wish to fry it up. 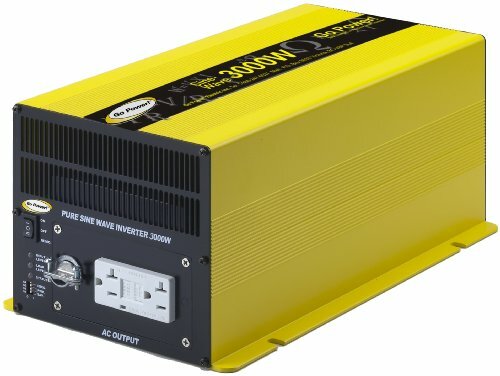 This is one of the lowest priced inverters of our list. It is not only usable for RV trucks but also useful for outdoor parties, camping, basement, and many other uses. Though it doesn’t cost much, the device is protected using various measures. Overload, overheat, high and low voltage situations will be warned with audible alarms. Besides, a small display is there to always notify you about the current and frequencies. The risk of this inverter lies in not having enough review from Amazon. However, we have tested it in our lab and didn’t have any issue with it. But we can’t guarantee how far you can go with it in the test of time. For the price, it won’t hurt if the machine gives out after using several month’s continuous uses. Various protection and warning system. Less suitable to charge a laptop, smartphone, and other delicate devices. This one is another budget-friendly inverter with 1500 watt capacity. 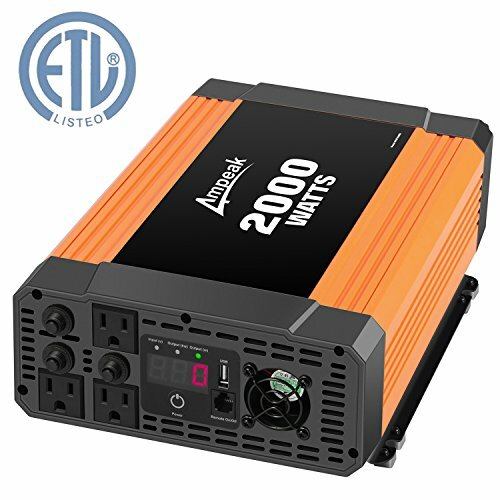 If you have installed a mini home-office in your RV/truck or trailer or just want to catch up with your work while leaving for camping, this inverter will be really helpful. As it is pure sine wave inverter, you can operate tv, laptop, speakers and other gadgets. 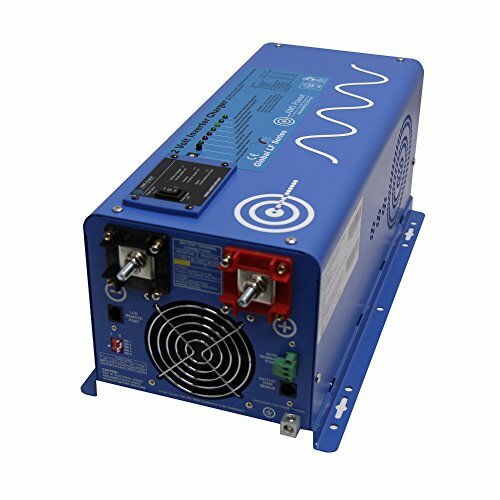 Unlike other sine wave inverters, this one can also be helpful for home appliances like oven and freezer. The best thing about this inverter is, it comes with all the equipment you need to install and operate it. The installation is very easy with the manual and supplies. A remote control panel is also included in this price. This unit is highly protected against short-circuit, high and low voltage. The power quality is satisfactory, but the customer service upon any defect is quite non-responsive. But that is the case about most of the low-cost RV inverters. So, for the price, this inverter is a good one to run both home and office gadgets smoothly while traveling off the grid. Suitable for office and home appliances. Not recommended for smartphone chargers. To be honest, the basic features of this inverter is nothing extraordinary. Besides, it is the most expensive pure sine inverter of its class of 2000 watt capacity. Despite that, it ranked in our list because of its longevity. Very few people are interested in fixing inverter related problems while they are away from home enjoying a vacation. 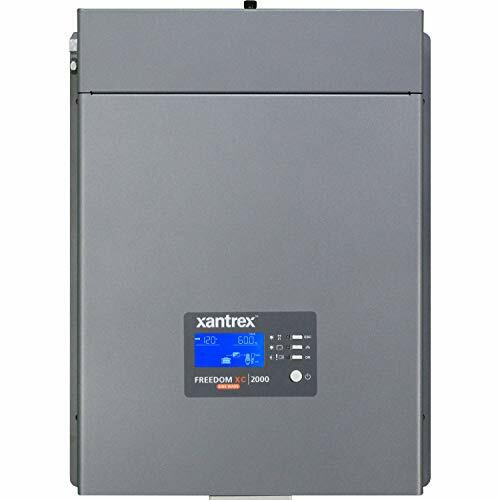 For those, there is no alternative than this Xantrex inverter. I wonder if these are made of alien technology, but I have heard reviews that people use these inverters for almost over a decade without a hitch. This inverter has 2 AC outlets to meet most of your demand from running freezer to a laptop. Though the capacity is low, the surge rating is very high which is really handy to kickstart any motor like fan or blender and machines alike. To get the advantage of its 6000-watt capacity, this inverter has 4 outlets with it. This unit is the most powerful in our list, but the price is surprisingly budget-friendly. The surge rating is 12000 watt, which is enough to run several household appliances during emergency, camping or simply power cut. This inverter is protected from overload, overheat and short circuit. High or low voltage is warned by an alarm and auto shut down feature saves the unit from collapsing during severe situations. There is an additional cost of a lithium-ion battery to charge the inverter if you don’t already have one. Besides, there is a risk of not getting enough power from this device for the expected time. Because, for the price, quality or durability should be difficult to maintain. However, this unit has got a mixed review from Amazon. My realization is, using heavy and motorized equipment with caution will lengthen the life of this inverter. Even the most expensive inverters can give you a headache if the customer service is not responsive to your problems when you need it most. So, I prefer purchasing inverters based on their customer service and warranty options so that if anything goes wrong, you can claim for free service if not a replacement. Considering these points, I decided to incorporate this Krieger inverter despite its generalized features. The second cause is, it is durable and does not cause problems for over a year of use. You will get two outlets to use its 3000-watt power in various ways. It has all the protective measures you will see in any conventional inverters in the market. The added benefits are, it is lightweight, small in size and is affordable. The key point using an RV inverter is to power up devices and machinery off grid, not draining power by the inverter itself. This problem basically arises with thermally protected inverters with a cooling fan attached. However, this Potek inverter is the most energy efficient thermal protected inverter that will stay cool but won’t drain its charge using its fan. Because the fan starts when the inverter reaches a certain temperature. It is the features that I liked most about this inverter. The second most convenient thing is three AC outlets. Mostly, more powerful inverters come with 2 outlets and we end up using an additional plug to use multiple devices. 3 outlets will eliminate the need for an additional plug. This unit has gained popularity throughout Puertorico after cyclone Maria. People relied on it for survival from a power cut that lasted for months. Some even used a charge controller to get the inverter charged from solar panels. What can be more promising than that during emergencies? Any remote control panel is not included in the package. 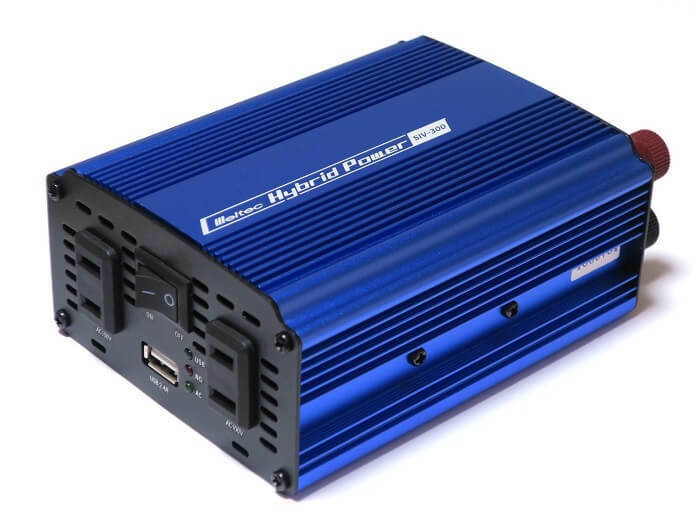 This Aims power inverter has the rare combination of affordability and quality. It will assure you quality and continuous power for a long period of time within affordable price. It has 2 GFCI outlets and an AC direct connect terminal. It has a pocket-size shape and weight and can be mounted and used almost anywhere. Its portability makes it more convenient to use in different situations like camping or powering basement, other than RV and vehicles. 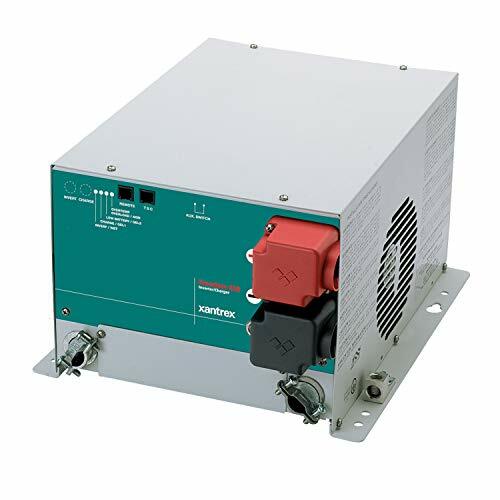 Its capacity is limited, and that should be kept in mind while operating this inverter. This way, this cheap unit will go a long way! Long term hassle free service. No matter how harsh the weather is, Xantrex inverters never fail. 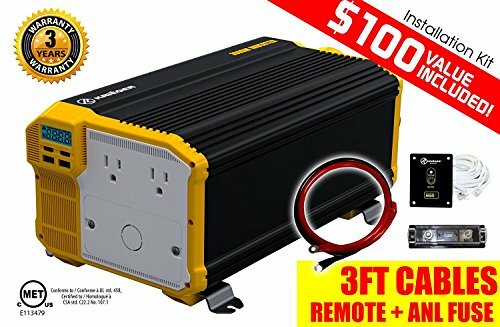 Whether it is freezing of snowing outside of there is a power cut for days, this inverter will be still running in that challenging situations. To overcome long term power cuts, you can attach this unit to a rooftop solar system and enjoy electricity without paying the bill! Installing this inverter is a no brainer job, whether you decide to use it with a solar panel or a battery. If anything doesn’t feel right after installation or operation, just all the customer service and they will send you a replacement as compensation. 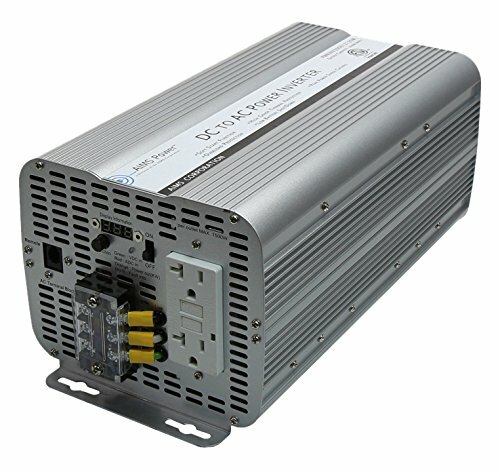 The price is quite high for a low capacity inverter. But considering its versatility, it totally worths the price. A remote control panel is not included. RV inverter is also called as ‘power inverter’ for a recreational vehicle. RV inverters are generally power converter with some extra power storage capacity. They also have plugs that allow you to use it as a charger. This is the indispensable tool for running any kind of domestic appliances at home, caravan or even in camping. Like, they can charge your smartphone or provide extra power that is stored in its own battery. Some inverter chargers can be used as both converter and inverter by only transferring the switches, fuses and another electric safety element. A pure sine inverter creates a cleaner, smoother power supply for your RV. It helps you to run all of your smart devices like- smartphone, laptop and even big screen TV. though it is a little bit expensive but worth it if you want to run too many devices with it. Modified sine inverters don’t have any extra component to give you a smooth and clean power supply. So they are cheaper than pure sine. They are perfect for running any basic devices like- blenders, pumps, drill and air conditioner. But you can not expect it to run all of your devices like the pure one. This is the most important question you need to find the answer before buying an RV inverter. In this buying guide, I’ve discussed some features that make an RV power inverter the best one. If you are looking to buy a new one, can go through it. While buying, first you need to check whether the battery power is sufficient or not. Make sure that the batteries of the inverter have adequate power to operate it with your desired devices. To have the idea about the power consumption, get total power consumption then convert it into watts. Now divide the figure by ten. The next thing you should check is the size of the inverter. By the size of the inverter doesn’t refer to the physical size of it, it means the output of the device in the form of watts. So check how much watt or power need to run your devices and get one with 15% more so that you can avoid any unwanted situation. Another thing you should check that the inverter you’re going to buy has the facility of overload protection. This feature will help the inverter to shut down automatically in case of overload. You’ll find two options to choose from for waveform output- pure and modified sine. Modified sine is more affordable than pure one and with it, you’ll be able to run most of your appliances. On the contrary, a pure sine wave can generate cleaner output through the main supply and you can run all of your appliances. Before buying, make sure that it should not increase energy consumption too much and also don’t influence energy loss. The operating period is the length of time of operation of an inverter. It mostly depends on the capacity of inverter’s battery and measured in AMP/ hour. So check that the inverter you’ll buy doesn’t run the battery flat immediately after the input voltage goes below. This type of inverters come with the feature of sending an alarm in case of battery failure. Q: How many watts I need for an RV inverter? Ans: Actually it depends on how much power you’re planning to draw from it. For example, a cell phone draws highly 50 watts, LED lights draw near 25 watts, fans draw 75- 120 watts. Whereas, a toaster draw 800- 1500 watts or a toaster oven may draw 3000 watts. So deciding how many appliances and devices you want to run with it will help you to get choose the inverter that you need. Q: Which inverter will be better for me, Pure Sine or Modified Sine? Ans: It depends on what type of devices or appliances you’re planning to run with it. If you want to run ceiling fans, vacuums, hair dryers, light bulbs, modified sine will work great. If you’re planning to operate computers, HD TVs, satellite receivers or other smart devices, pure sine will be the best choice. Q: How can I use my RV inverter? Ans: One of the most interesting things about RV inverters is they are so easy to operate. After installation, you simply need to turn it on and connect the devices or appliances you want to power up. Conclusion: Selecting the best inverter ensures you a smooth and uninterrupted power supply at your home or camp. But choosing the right one is a bit of tricky as you’ll find so many options to choose from. That’s why I’ve tried to simplify the process for you to choose the one. Just carefully follow the instructions, match them with the available inverters and you’ll end up with the one you need. You can also check the list I’ve mentioned with specifications. They are the most popular items in today’s world. 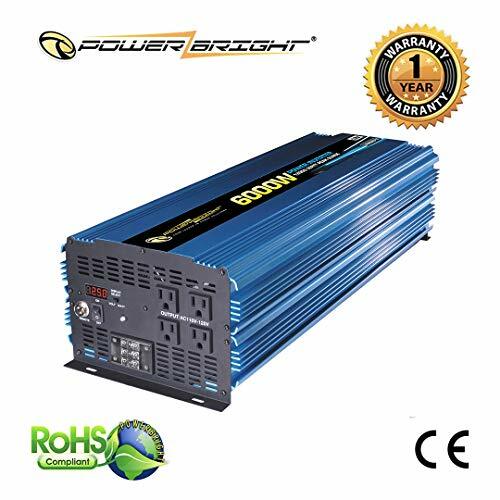 The most important thing you need to remember for buying an inverter is never compromise with price if you want a smooth supply and use it for a long time.